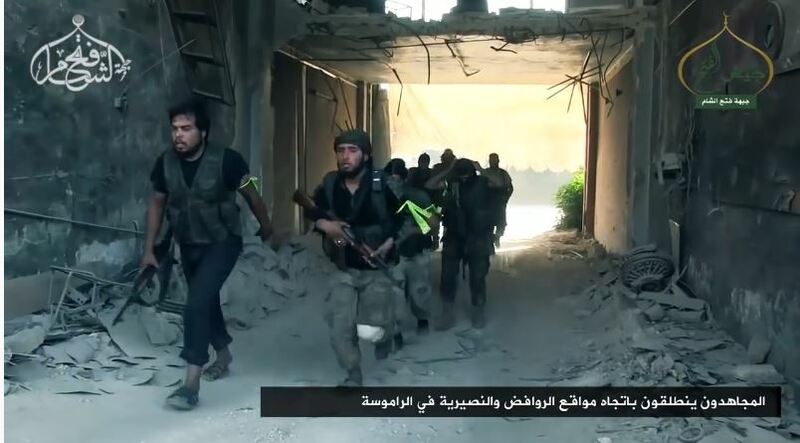 ANALYSIS / OPEN-SOURCE INVESTIGATION – The jihadist fighters of Jabhat Fateh al-Sham in Syria get their money and arms from taxation, tariffs, spoils of war, ransom, donations, oil trading, looting, asset seizure, sieges and smuggling. Jabhat Fateh al-Sham (Arabic: جبهة فتح الشام; literally “The Front for the Conquest of the Levant”, abbreviated as “JFS”) is a Sunni Islamist militia fighting in Syria. Some believe the group could become more of a threat to the security of Syria than the so-called Islamic State (IS), since JFS “has established an expansive network of partnerships with local opposition groups that have grown either dependent on or fiercely loyal to the organization”1 and, most recently, its important role in breaking the siege of Aleppo.2 Formerly known as al-Qaeda affiliate in Syria Jabhat al-Nusra, the group renamed itself to JFS and claimed it cut international ties. However, the United States (US) continues to consider the group as a foreign terrorist organisation, and continues to be bombed by especially Syrian and Russian warplanes. Overview of territorial control in Syria as of early August 2016. Jabhat Fateh al-Sham (blue) holds large parts of Idlib, as well as small parts in the Aleppo, Hama, Homs, Rural Damascus and Dara’a provinces. IS’s influence in the Levant on the decline, while JFS’s influence is on the rise. In Syria, IS has lost control of much of north-eastern Syria to the Syrian Democratic Forces and in 2015 IS lost the city of Palmyra to the Syrian government. In Iraq, the so-called international coalition has successfully pushed IS out of Ramadi, Tikrit and Fallujah.3 That being the case, the question of how JFS secures its income and resources is increasingly relevant. Apart from IS, JFS is the most powerful transnational jihadist group operating in Syria. This open-source investigation examines JFS’s finances in depth, using a wide variety of sources ranging from the organization’s own documents and propaganda to citizen activists on the ground. The article identifies a variety of key income flows, including taxation and tariffs, spoils of war, ransoms, donations, oil, looting and asset seizure, and sieges and smuggling. Like IS, JFS governs parts of the territory it controls and has a sophisticated administrative structure. It establishes Islamic courts and carries out public works and civil services. With territorial control also comes the ability to tax and fine locals. JFS imposes a number of taxes on the citizens that live under its rule, including income and business taxes, as well as utility and services taxes. An example is the JFS’s taxation of water. 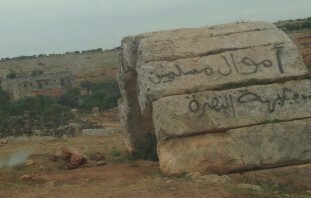 Beneficiaries of a water dam close to the town of Darkush in the Idlib province have to pay 3,000 Syrian pounds per dunum (a unit of area) over the course of 2016, according to a specimen obtained by Jabhat Nusra Violations (JNV), a clandestine group documenting daily life in JFS-controlled territory. That amount is equivalent to about 12.50 euros per 1,000 square metres at the official exchange rate (the actual exchange rate might be different). 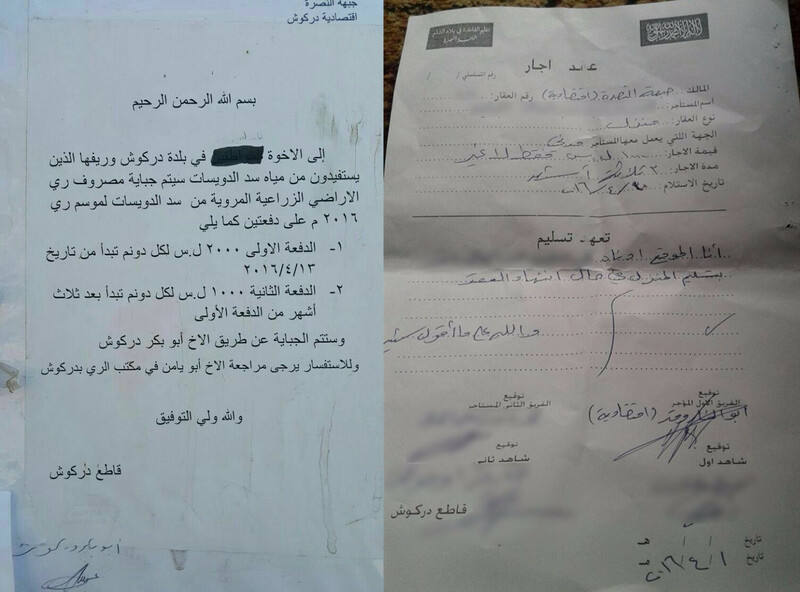 At left, a document announcing that beneficiaries of the dam need to pay a 3,000 Syrian pound tax. At right, a rental contract. Both images were published by JNV. Another specimen published by JNV shows what appears to be a rental contract for a house, hired out by JFS in April 2016. For a period of three months the expenses are 1,000 Syrian pounds, or about 4.15 euros. Under the contract the house is to be returned to JFS after expiration. JFS rents out houses throughout the Idlib province, including Darkush, and the villages of Al-Doisat, Zanbagi, and Jamilieh. The specimen was used by a Twitter account supportive of the Free Syrian Army (FSA) to indicate that JFS was taxing internally displaced persons (IDPs) in the Idlib province,6 but the claim could not be independently confirmed. A reporter for the Step New Agency has told Hate Speech International (HSI) that JFS’s most stable tax income is what it receives for electricity provided by generators. 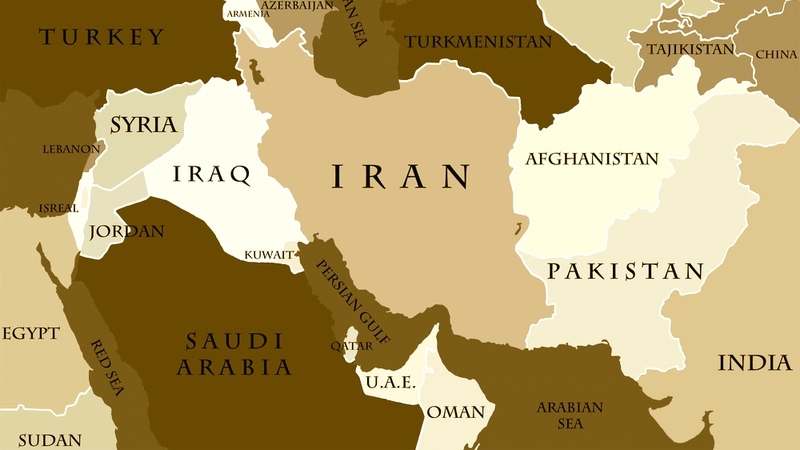 With the collapse of state services and institutions, commerce and trade in JFS-held territories has fallen under the management of a complex network of Sharia courts, businesses, smugglers and JFS itself. A key source of JFS’s funding is ‘import tariffs’ on goods that enter JFS-held territory. While a traditional tariff would be paid in cash or cash equivalents, JFS often takes a percentage of the tariffed goods instead. Exactly how much JFS collects from such import tariffs is not available due to a lack of standardisation and documentation. Some data on the tariff JFS levies on arms and ammunition passing through JFS held territory is available, however. This “arms tariff” is particularly important as it provides JFS with a regular source of the arms and weaponry it needs to sustain operations. As part of its arms tariff JFS appears to take up to half of the foreign-supplied weapons sent to the FSA in Northern Syria. Arms tariffs thus seem to be a significant source of supplies and funding for JFS. Furthermore, US and other foreign support for FSA can indirectly result in ammunition and materials for JFS. However, it is important to note that JFS’s ability to enact arms tariffs is partially due to its strength in Idlib, Aleppo and Latakia governorates; in areas where JFS is weaker (such as Daraa, Homs, and Rif Dimashq governorate) the JFS “arms tariff” may not be as significant of a funding source. JFS’s tariff system extends beyond arms and ammunition. The group places import tariffs on a variety of standard goods, including construction equipment, building materials, food and fuel. Key goods, such as gasoline and diesel fuel that are important to JFS operations, are likely tariffed at a higher rate. Specific figures on these tariffs are unavailable, but they are certainly a significant factor, as JFS appears to have a documentation system for its tariffs of standard goods. JFS has a special transit office which hands out passage permits for civilian vehicles. The office falls under the organization’s general economic affairs, and is operated jointly with Ahrar al-Sham, a coalition of multiple Islamist and Salafist units which cooperate broadly with JFS. 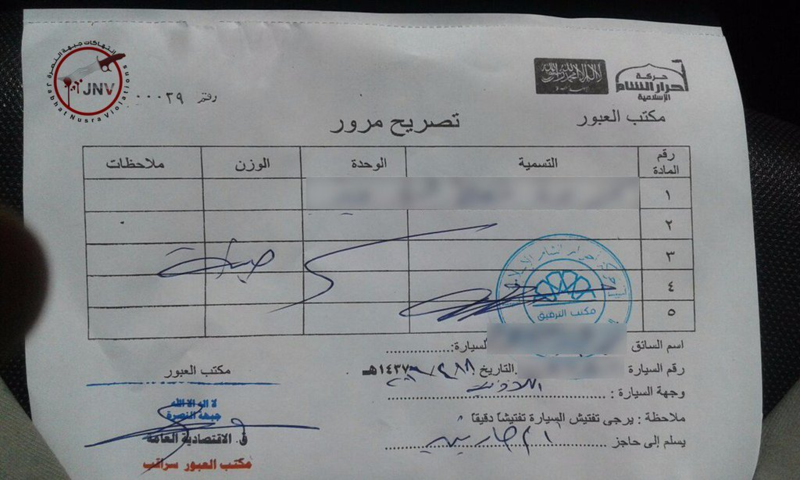 JNV has published a photo of an JFS/Ahrar al-Sham passage permit, which details the name of the specific good that is being transported, the number of units, and the weight. It also mentions the name of the driver, the car’s colour and plate number, and suggests a careful search of the car. This specific permit says the vehicle should be handed off to another checkpoint, called “Um Harteen”. Fines account for a small part of JFS’s overall income, but they typify the organization’s governing practices. 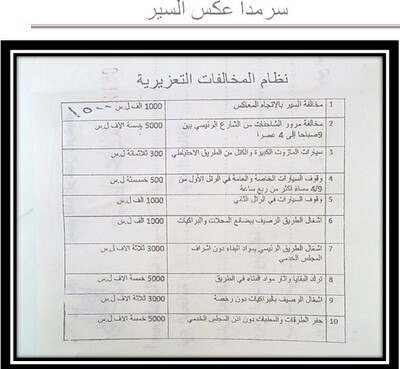 The specimen pictured, from April 2015, lists the amounts to be paid for traffic and road violations in and around Sarmada, Idlib province.12 The fines range from 300 Syrian pounds (“large diesel oil cars and blocks”) to 5,000 Syrian pounds (“Violation of the passing of lorries from the main street between 9 a.m. and 4 p.m.”). In all, taxation, tariffs, and fines provide a stable income for JFS, just as they do for IS. IS has benefitted as well from salaries still paid by the Iraqi and Syrian governments to civil servants working in IS-held areas.14 According to Step News Agency, the same applies to JFS in the territories it holds. “The salaries [are] still supported by [the] regime for those who were working as government employees before,” one of the agency’s reporters in the Idlib province told HSI, though some salaries have been cut to reduce government expenses. Hundreds of employees travel monthly or bimonthly to Hama, a city held by the regime, to pick up their salaries. But JFS and other rebel groups try to stop this, as they want to install their own administrative bodies. Spoils of war, or ghanima (Arabic: الْغَنيمَة), are a key source of supplies that allow JFS to conduct offensive operations. While JFS does seize ghanima from the largely Kurdish YPG as well as other rebel groups and IS, the amounts are small compared with the weapons, vehicles and equipment it seizes from the Syrian government. 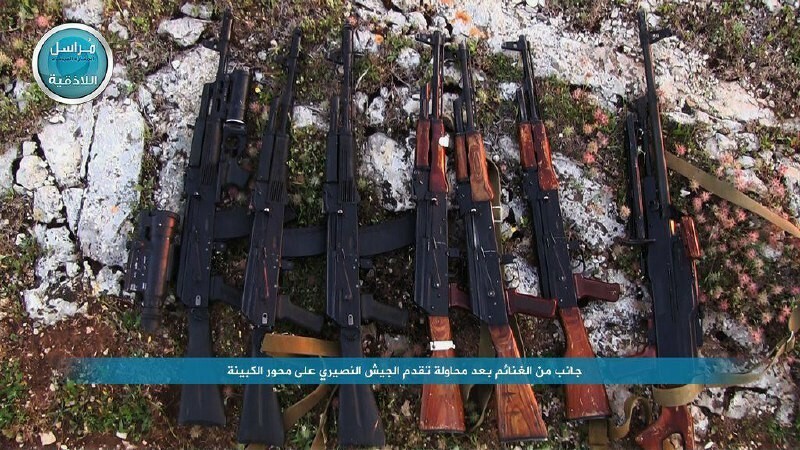 Small arms captured by JFS near the Kurd Mountains. 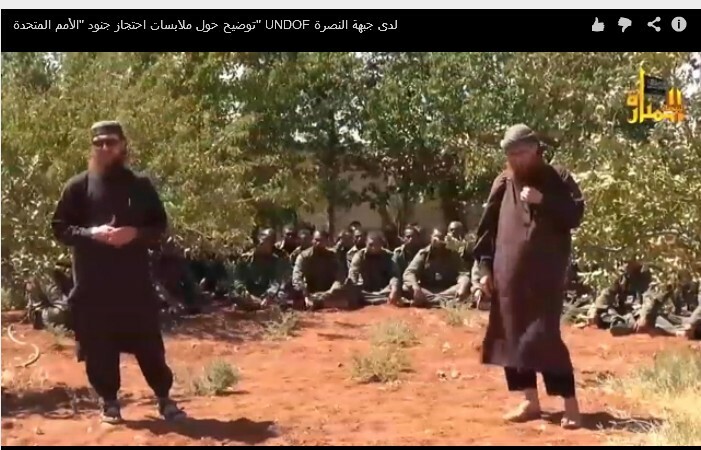 Photo published on an JFS Telegram channel on 15 April 2016. Since JFS does not receive as much foreign support as the more moderate rebel factions, ghanima is disproportionately important to JFS. Small FSA groups can rely on foreign backers for weapons and ammunition even if they fail to capture significant amounts of ghanima. In the absence of ghanima, JFS’s only options are to make expensive purchases through the black market or to improvise weapons themselves. JFS regularly releases video and photographs of major seizures of ghanima after battles. Using research by open-source analysts, an estimate can be made of the total amount of ghanima seized (and published) by rebels in certain battles and campaigns throughout mid-2015. JFS made up a plurality or majority of the rebel forces in these battles and campaigns. These numbers give a very rough estimate of the amount of ghanima seized by JFS. The actual amount of ghanima that JFS obtained in these battles is somewhat higher than the listed total, as not all ghanima is photographed or documented. JFS would not be able to function as effectively as it does without armoured vehicles. Tanks allow the group to shatter enemy frontlines. Infantry fighting vehicles (IFVs) and armoured personnel carriers (APCs) act as moving cover for rebels, allowing them to rapidly advance under fire. Civilian trucks and other vehicles, too, are extremely useful for JFS as they can be converted into vehicle-borne improvised explosive devices (SVBIEDs) and used with great effect to shatter enemy morale and cause a rout. For instance, the 2016 South Aleppo offensive saw the effective use of multiple SVBIEDs, leading to rebel gains despite heavy Russian airstrikes. The second battle of Idlib in 2015 saw the use of multiple coordinated SVBIEDs to destroy large government defensive fortifications, leading to the fall of Idlib to the JFS-dominated Jaish al-Fatah rebel coalition. While further discussion of JFS tactics is not within the scope of this project, it is clear that vehicle ghanima (largely seized from the Syrian government and its allies) plays a major role in the group’s combat operations. Arms and ammunition are two other major categories of ghanima that must be covered. In the category of small arms, light weapons and artillery, we can see that ghanima remains a key source for JFS operations and funding. Accurate small-arms figures are hard to obtain as small arms are often taken from dead enemy fighters and not photographed. The number of captured small arms listed here is therefore drastically understated. The other figures tend to be more accurate; the counts for captured anti-tank guided missiles (ATGMs) are considered a fairly accurate estimate. ATGMs are used by JFS to destroy tanks and other enemy vehicles. Ammunition is the final category of ghanima examined in this article. These ammunition captures are very rough estimates, and the imprecision should be taken into account in analysis. 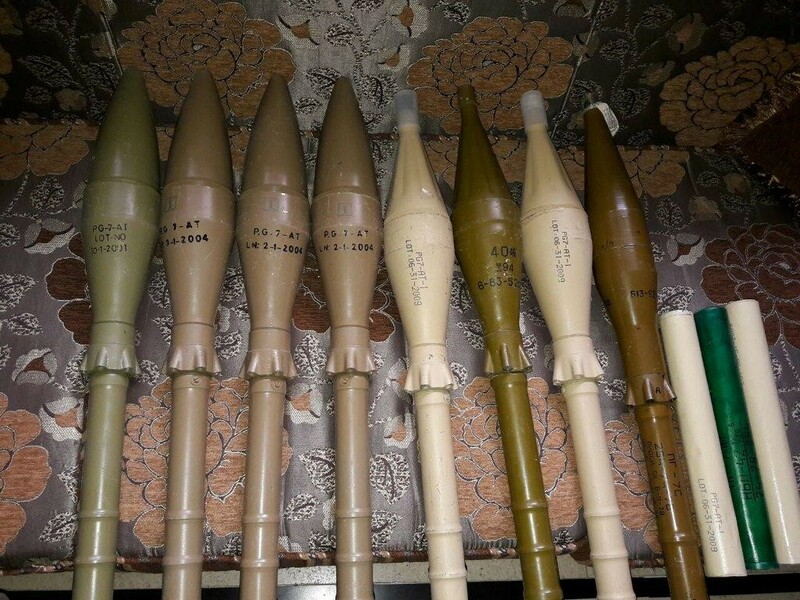 JFS cannot sustain its offensives without capturing large amounts of ammunition, since it is not easy to buy millions of rounds of ammunition on the black market. While not listed in the total counts due to lack of data, captures of air-defence systems from the Syrian government have been a major factor in neutralizing the Syrian government’s air force. Ghanima is the fuel on which JFS runs; without it JFS is nowhere nearly as effective. Whether used to fight enemies or sold on the black market for cash, ghanima is a key factor in JFS’s operations and governance. It may be impossible to accurately appraise JFS’s total ghanima or the total profit from its ghanima sales, but the rough estimates we have clearly show ghanima’s importance to JFS. Kidnappings of civilians and, on some occasions, military personnel for ransom have been a significant source of income for JFS. The group has been involved in several high-profile hostage cases, especially between 2012 and 2015. Screenshot from an JFS video of Fijian UN peacekeepers held hostage. A ransom of $20 million to $25 million was allegedly paid for their freedom, though the UN denies it. In December 2013, for example, a group of Greek Orthodox nuns was taken hostage from their convent in Ma’loula. The nuns were released in March 2014, reportedly in exchange for $4 million and several prisoners held by the Syrian government. The deal was negotiated by Qatari and Lebanese officials.35 In September 2014, JFS kidnapped 45 Fijian UN peacekeepers near the Israeli-occupied Golan Heights, claiming that the Blue Helmets were supporting the Syrian government. The peacekeepers were released two weeks later. A ransom of between $20 and $25 million was allegedly paid to JFS, but this has been denied by the UN. Not all hostages have been lucky enough to be ransomed. 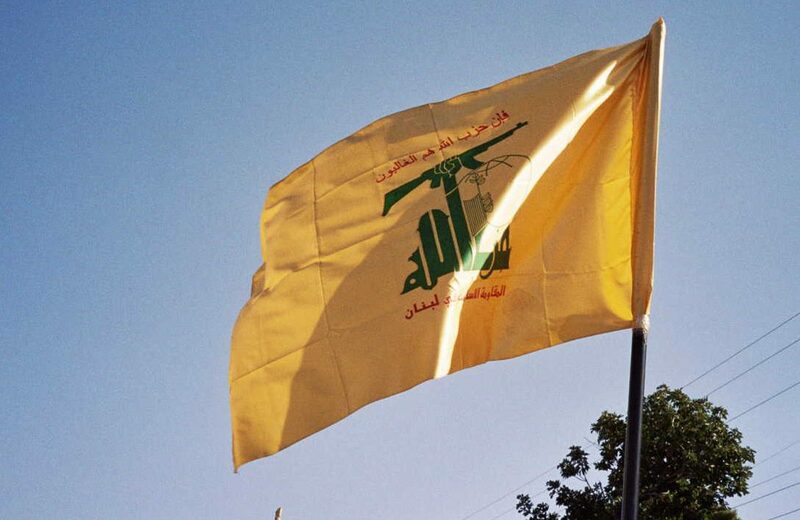 In the course of 2014, JFS killed four Lebanese soldiers it had taken hostage after the Lebanese government did not respond to JFS’s request to withdraw Hezbollah from Syria. Although ransom payments for hostages do not provide JFS with a stable income, opportunistic kidnappings do raise millions of dollars for the organization. It is a “big financial source”, JNV told HSI. Open-source information confirms that hostages for ransom are an effective and lucrative business, accounting for millions of dollars a year to JFS. Designated terrorist organizations often enjoy a stream of donations from supporters around the world, and JFS is no exception. Donations can take the form of small amounts from local communities or much larger sums. According to the Treasury of the UK, private donations “from the Gulf are a vital funding stream for [al-Qaeda] affiliated groups”. An obstacle to open-source tracing of donations is the informal value transfer system known as hawala (Arabic: حِوالة‎‎). This system uses intermediaries and brokers to maintain plausible deniability. Once money is donated, it can be passed on to a network of facilitators who deliver the money to JFS without suspicion. This can be done through small money transfers for which no identification documents are needed, or by a person who brings the cash across the border. However, there have been instances of private businessmen from the Gulf raising funds for JFS publicly. Qatari connections to JFS have become clear in many hostage negotiations. Some Qatari negotiators have also been named by the US Treasury as major JFS fundraisers. 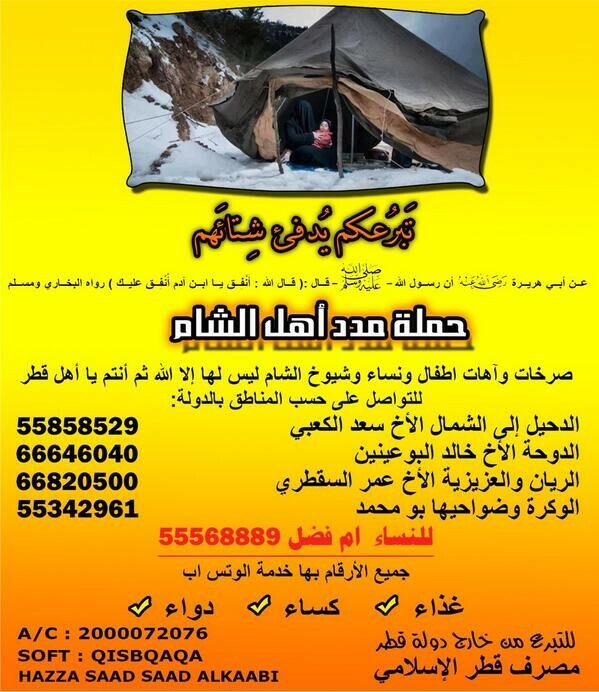 A digital flyer for Madid Ahl al-Sham, an online fundraising platform for al-Qaeda. Online fundraising platforms have also been used to raise money for JFS. Qatari ’Abd al-Latif bin ’Abdallah Salih Muhammad al-Kawari, for instance, used the Madid Ahl al-Sham (Arabic: مدد أهل الشام) platform to raise and arrange the delivery of money to al-Qaeda, according to a US official.46 The network has since been shut down. Oil used to be an important source of income for JFS, as the group occupied oil fields around the Syrian city of Deir ez-Zor. But in mid-2014, ideological and tactical differences increased between JFS and IS, with the latter driving JFS and a number of allied groups out of its key strongholds in the oil-rich Deir ez-Zor province in eastern Syria.51 IS thus gained control over the various oil fields and JFS lost an important source of income. Nevertheless, JFS and its allies retain control over several mobile oil refineries and oil markets in Idlib province, near Jisr ash-Shugur and Saraqeb.52 The organization is thus able to generate income from oil. According to research by the Financial Times, two types of fuel are sold in the areas JFS controls: “pricier fuel refined in [IS] areas, and cheaper locally refined fuel”. Locals often buy a mix of both, using the better quality for their vehicles and the cheaper variety for generators. Oil-related facilities and smuggling routes linked to JFS have been struck by the Russian Air Force. These strikes began intensifying on 20 May 2016, according to a news briefing from the Russian Armed Forces. Prices of oil and diesel in rebel-held areas have doubled since the air strikes began, according to Financial Times. One effect of higher transport costs has been a rise in food prices. Screenshot from a recent video released by Jabhat Fateh al-Sham, showing fighting in Ramouseh, Aleppo. Looting and asset seizure by armed groups is prevalent across Syria. Virtually all sides in the conflict have been accused of looting or asset seizure at one time or another. Verification of individual cases of looting and asset seizure is often challenging due to poor documentation; however, it is often a significant source of funding for actors in the conflict. It is important to make a distinction between looting and asset seizure for the purpose of this article. “Looting” will refer to cases in which JFS fighters take assets from civilians and other non-combatants without official authorization from JFS leadership. “Asset seizure” refers to when JFS takes assets from civilians with official authorisation from JFS leadership. Looting by JFS fighters has been documented on several occasions. For instance, when the Nasib border crossing in Daraa province fell to rebel hands in April 2015, JFS fighters and other rebels were spotted carrying off goods seized from civilian-driven trucks.53 It is unclear if the goods looted were used by the organization or by JFS fighters. Both asset seizure and looting often have a sectarian aspect, with JFS targeting minority religious groups. In Idlib, for example, an JFS commander attempted to seize a house from a Druze civilian,54 resulting in the massacre of Druze civilians and the seizure of goods from the house in question. While JFS later condemned the attack, it had had the approval of a commander within the organization at the time.55 While other funding sources may be more important to JFS than looting and asset seizure, the looting across JFS-held territory appears systemic. Even if such activities are not fully approved, repetitive incidents suggest that the group’s leadership tolerates them when it targets minority religious groups. The war in Syria differs from other recent conflicts in part because of the many sieges that have occurred. One reason besieged urban areas have been able to hold out against foes is the poor quality of forces that operate in Syria. Corruption is rampant on all sides, and sieges are rarely airtight.56 The smuggling of food, ammunition and goods into besieged areas is often both a necessity for the groups and civilians under siege and a way for corrupt besieging units to make extra cash. When under siege in areas with a significant civilian population, JFS is able to smuggle in basic necessities and sell them to the civilian population. For instance, the group dug tunnels from the besieged East Ghouta area to the Barzeh and Qaboun areas of Damascus.57 This allowed it to sell basic necessities to civilians in the area, providing some funding for the group. Even when tunnels are not built, JFS is able to employ smugglers who bring food and other goods that can be sold to local civilians. This type of “siege smuggling” is only possible in areas where JFS is under siege. 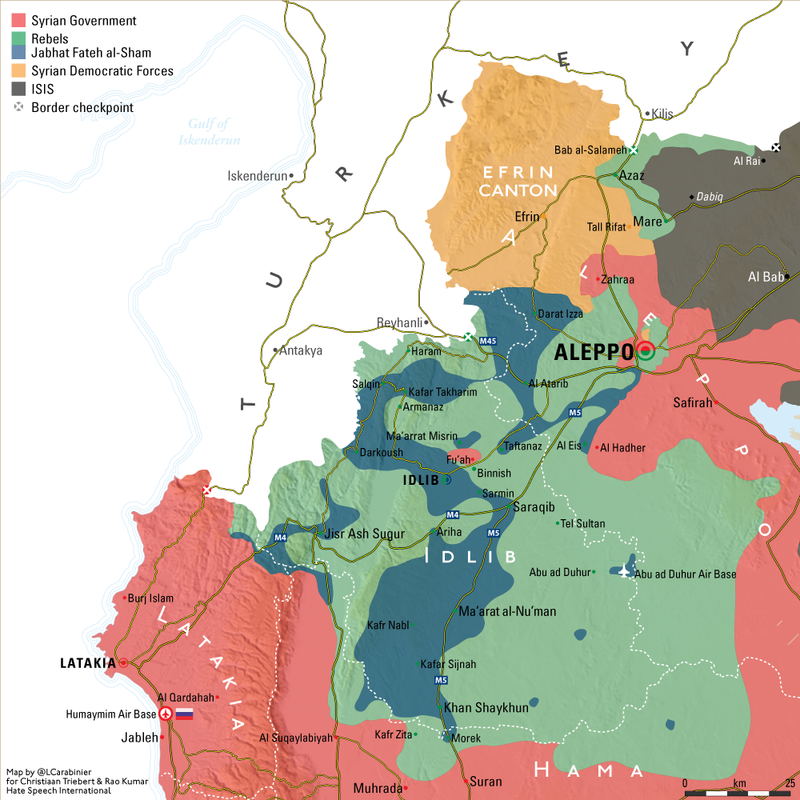 The majority of these areas are in Rif Dimashq governorate or in Damascus governorate (i.e. E. Ghouta or the Yarmouk Camp). The rebels in northern Syria are much stronger than those in southern Syria. Thus in northern Syria, JFS fighters can raise funds by selling goods in government-held pockets under siege. In Idlib governorate the government-held towns of Fu’ah and Kafriya have been under rebel siege since the Second Battle of Idlib in 2015. While a recent truce between the Syrian government and the rebels has allowed the entry of aid to the besieged pocket, corrupt JFS fighters are able to profit by selling goods there.58 This funding source is not significant compared to the money JFS makes from smuggling into pockets besieged by the Syrian government, but that is mostly because there are more besieged rebel pockets across Syria. Historical artefacts have also been “claimed” by spraying graffiti on them, declaring JFS to be the “heroes of Muslims”, according to JNV. Among the litany of rebel groups in Syria, JFS stands out for its size, effectiveness and degree of organization. 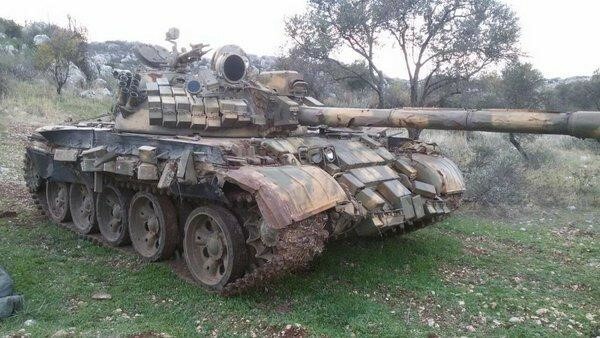 Its ability to finance its operations is a major factor in allowing the group to dominate the field in rebel-held territories in northern Syria. Funding also allows JFS to govern and provide services to civilians, enhancing the group’s legitimacy among the population, although many locals have protested fiercely. While much of the organization’s income and resources initially came from foreign donors, JFS increasingly relies on funding sources more typical of a government. Taxes, tariffs and fines are typically levied by governments, but are key in JFS’s overall funding structure. Unlike most governments, JFS also relies heavily on spoils of war, hostage ransoms and smuggling to fund itself. Looting and asset seizure are also significant funding sources, though both are more typical of a militia than of a group seeking to replace the Syrian government. JFS’s diverse funding sources highlight the complex and contradictory nature of JFS itself. 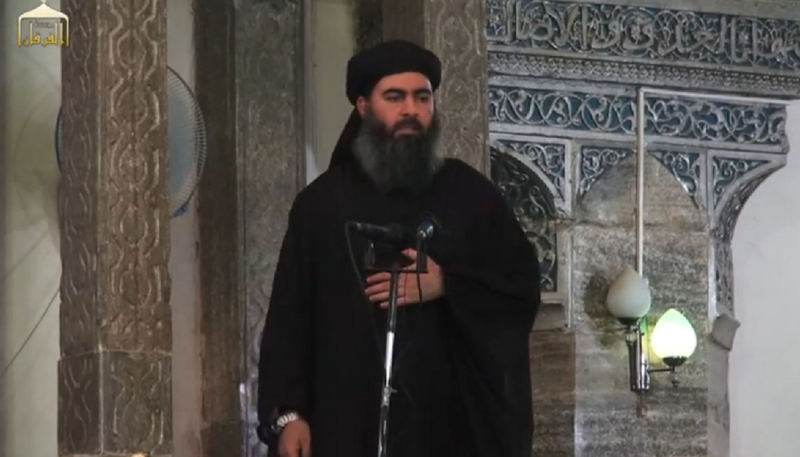 It is an armed Islamist group seeking to form an Islamic proto-state or “emirate” in Syria. JFS provides state-like services to the population, but like a typical militia it relies on capturing supplies in battle to fund its operations. JFS is essentially a non-state actor and proto-state that aspires to statehood. The group’s complex funding network shows just one facet of the slow and complicated rise of an JFS proto-state in northern Syria. While this growing proto-state may not enjoy the glamour of the IS “caliphate”, it is a clearly a rising threat to international security. Indeed, JFS will remain a major player in the Syrian civil war and in the global war on terror for the foreseeable future. A map of the Damascus area JFS extent would be helpful. They have a significant presence there. Not mentioned in your article is the JFS auxiliary “Syria Civil Defence” which attracts many tens of million of foreign funding – some of which certainly flows to JFS. SCD is essentially collocated with JFS asides from a couple of units in IS areas left over when JaN moved out. What towns are supposed to be under control of JFS in south east Daraa? Mseifra and Jiza? Jiza has maybe 12 JFS fighters in it and JFS in Mseifra are not the dominant force in the city (that would be Liwaa Ahbab Omar, I believe). They certainly aren’t present in Busra al-Sham. Perhaps the map is indicating Ghasm down to Smaqiyat?